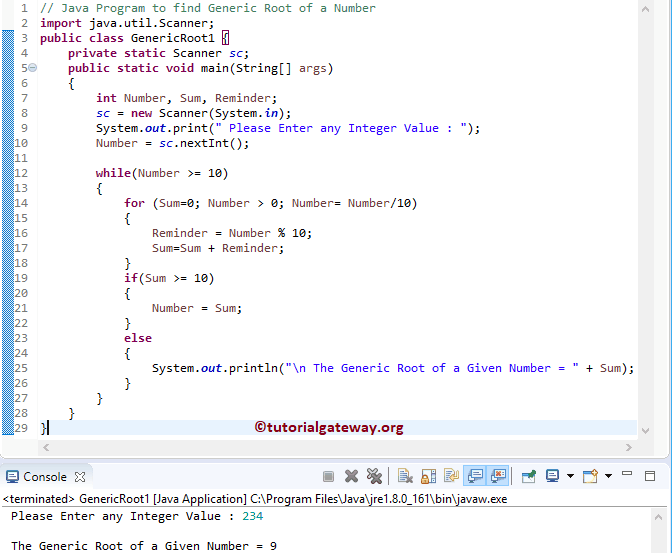 In this article, we will show you, How to Write a Java Program to find Generic Root of a Number with example. This program allows the user to enter any positive integer value. And then, it will calculate the Generic Root of that given number using While Loop, For Loop, and If Else Statement. => (Sum=0; 234 > 0; Number = 234/10) – Condition is True. Next, Number value will be updated by For Loop. if(Sum >= 10) – Condition is False. So, it will execute the statement inside the Else block. This program is same as above example but we separated the logic, and placed it in a separate method.